Are intelligent mixing assistant plugins dumbing down the art of mixing? iZotope's Neutron is smarter than the average mixing plugin. 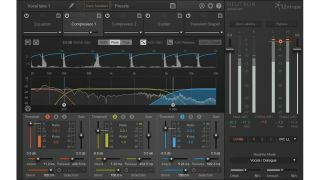 With iZotope's Neutron 'mixing assistant' plugin proving that software algorithms really can deliver the goods when it comes to making sensible, sensitive mixing decisions, are we on the cusp of an exciting new epoch in music production? Or is it a Terminator-style step to far, ill-advisedly relegating the essential human element secondary to the creatively simplistic whims of 0s and 1s? We asked four industry players - including iZotope themselves - to give us their take on the situation. "Technology is there to offer us quicker solutions to problems and tasks. You ride a bike to the grocery store instead of walking, or write a text message instead of a real letter - that doesn't dumb it down, it makes it faster and more convenient for you. "Mixing assistant tools give you help and suggestions, but it's still up to you to decide if you want to keep those suggestions and control their intensity. An engineer will always be the last link in the quality control chain anyway, and it will always be up to you to be responsible for what goes out and what doesn't." "In short, no. The art of mixing is deep, nuanced, and requires an aesthetic determination that could differ entirely between different mix engineers even if they were mixing identical audio. Intelligent tools have their place in the audio production toolkit just like any other tool... to help mix engineers realise a vision that's uniquely their own. "Innovative, historical shifts in the audio production industry are few and far between. The introduction of electric guitars, of digital audio production, of synths, drum machines, pitch correction and more, have all been met with skepticism and fear. The robots are not winning, nor are they auto-mixing; they're helping you do things you already do today with greater efficiency and, ultimately, more creativity." "The answer is a little complex… In some sense, it's like saying that the invention of mixing is dumbing down the art of recording. "Intelligent mix assisting plugins are potentially enhancing the art of mixing, allowing a faster path to a good mix, and leaving more time for carving the aesthetics of the balance and the mix throughout. An effort saved transforms into more time to pay more and better attention to other details. "It's a little like saying GPS navigation doesn't help you get to know the way, but it certainly helps you get to more places on time with a reassuring feeling that you're not lost!" "As somebody who makes a living from mixing, I should probably be appalled by these tools… but I'm not. Done well, they're really useful tools for people who prefer to expend energy making great music than learning to be mix engineers. "Algorithms like those in iZotope's Neutron are clever and effective, and would bring the vast majority of mixes I receive to a much higher technical level, allowing my clients to craft a more coherent mix vision. Mixing creativity and mix interactions are what people pay me for, and by the time I can be replaced by a machine, I'll be too busy hiding from Skynet death squads anyway." What do you call a drum synth with 500 drum sounds, 500 samples and 500 MIDI clips?